Rob Stone and Jon Cohen look back at 100 issues of The FADER, and what’s coming next. 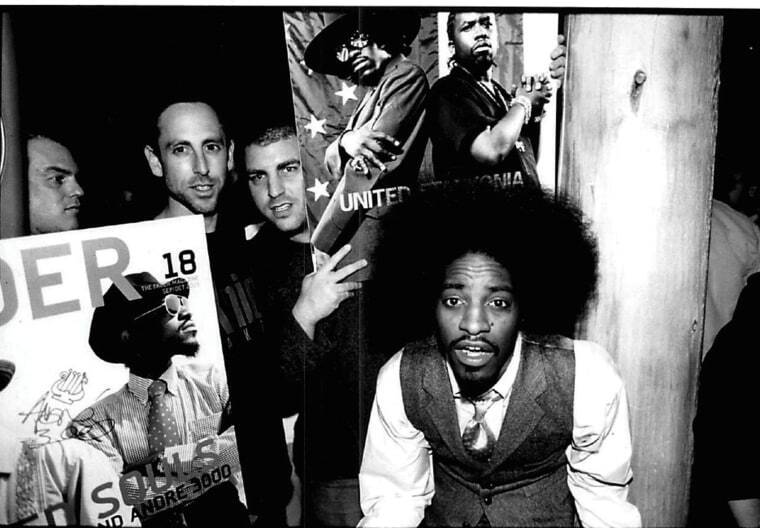 Jon Cohen, Rob Stone, and Outkast’s André 3000, in 2004. A fader allows a DJ to seamlessly mix together the sounds of one record with the sounds of another record. We created The FADER with that same purpose: to showcase the greatness in all genres of music, seamlessly moving between hip-hop and indie rock, dance and R&B, classical and country, while covering the culture that surrounds it all. Without any publishing experience, we broke all the rules with our first issue. I remember photocopying cool ads from other magazines and using them in ours so it felt like we were a real publication. We did things unconventionally with the sole purpose of delivering the purest form of creativity and exposing artists that were taking chances and doing things differently. We shot the cover for our second issue at Milk Studios in New York with an amazing young photographer, Jonathan Mannion. It’s still one of my all-time favorites. We had Run from Run-DMC, Zack De La Rocha of Rage Against the Machine, and DJ Premier of Gangstarr. For an unknown magazine, we really felt like we’d made it when Mariah Carey, at her height, peeked in from next door to see what was going on. Afterwards, Rage Against the Machine and Gangstarr decided to go on tour together—that might’ve never happened if it wasn’t for The FADER. We’ve had an incredible run since then. We’ve been ahead of the curve with magical first covers for Pharrell Williams, Kanye West, M.I.A., The Strokes, The White Stripes, Drake, Nicki Minaj, Kendrick Lamar, Frank Ocean, Phoenix, Miguel, Rick Ross, and many more. Our award-winning icon issues have gone in depth about the lives of Jerry Garcia, Miles Davis, Nina Simone, The Notorious B.I.G., and so many other important musicians. And we continue to dig deep and look far and wide to support true artistry, not only on our pages but on our stages at the legendary FADER FORT. There’ve been too many highlights to list them all, but I’ll always remember Kanye West performing with the entire G.O.O.D. Music family, N.E.R.D and their mind-blowing crew of double-drummers, Matt and Kim being joined by Erykah Badu, Diddy doing his classic Bad Boy hits. And of course our annual celebration of Bun B’s birthday. As we celebrate our 100th issue, it’s with tremendous gratitude to the many people who not only made The FADER happen but made The FADER exceptional. From past to current staff, managers, artists, journalists, photographers, DJs, our FARM team, friends, and the FADER family—we could not have done it without you. Over the last six months, we’ve experienced the greatest growth in our history. We’re truly becoming the leading voice in music and culture on a global scale. What I’ve realized most about The FADER is that music defines who we are. It brings out the best in us, comforts us, and accompanies us on our life’s journey. Listening to a new amazing song is personal—it becomes critical to our lives. It gets in our DNA. We’ll always shine the light on artists that we believe will make a difference. Now we want to bring that to every young person in the world. As we approached our 100th issue, I’ve been asked, “What’s the one thing you are most proud of with The FADER?” It’s been an amazing 16 years, and so many moments come to mind. Some make me laugh, some make me cringe, but most make me realize that what we’ve built has exceeded my wildest dreams. Even beyond all the artists whose first covers were for The FADER and whose first performances we have presented, I find myself going back to the initial conversations and various backstories that led to those big moments in the first place. Lee Harrison playing me the demos for this new act James Murphy had just started called LCD Soundsystem. Chris Atlas inviting Kanye West up to the office to meet everyone when he was just an emerging producer. Robert English coming up with the idea to have The FORT host a tribute to Lou Reed. More than anything, I’m proud of the people who helped us build The FADER: our writers, editors, designers, photographers, sales and marketing teams, accounting, FARM team, and interns that have poured their passion, energy, and lives into making The FADER great. Under the leadership of Lee Harrison, our first editorial team really set the tone for what we have built: hip-hop on the surface, punk rock at the core. Over the years, each edit team has carefully maintained that vision while adding their own layers and personality. From New York to London to Atlanta to L.A. and Brazil, we built a community that continues growing stronger than ever, 100 issues in, under the excellent guidance of Naomi Zeichner and Joseph Patel. Along the way we were lucky to find Andy Cohn. Andy has been the magnet to bring so many worlds and facets of The FADER together. It’s rare you find someone who can run the business side and also have the love and respect of every artist we cover. And last but not least, FADER would not be here if it were not for The Professor, Anthony Holland. For 16 years we have been throwing out ideas, and Anthony has always figured out how to make them happen, sometimes sleeping on the couch in the office for nights in a row to get it done. It’s been incredible from my perspective to watch the FADER family grow and come together. The camaraderie, creativity, and love for what we were doing has been the biggest part of our success. Read more from our 100th issue, including cover stories with Drake and Rihanna.